MTN CEO Phuthuma Nhleko: Case for such a deal "highly compelling"
(CNN) -- Indian telecom services provider Bharti Airtel Limited and South Africa's MTN Group Limited have renewed merger talks with the aim of creating an emerging market telecom giant, both companies announced Monday. Such a merger would create an operator with combined revenues of over $20 billion and a combined customer base of over 200 million, according to both companies. In addition to savings, "this opportunity also represents a first of its kind in developing an Indian-African initiative that would serve as a shining example of South-South cooperation," said Bharti chairman and managing director Sunil Bharti Mittal. MTN CEO Phuthuma Nhleko called the case for such a deal "highly compelling," saying, a merged company would have "leading positions in three of the fastest growing wireless markets globally -- India, Africa and the Middle East, with no overlapping footprint." Under the potential deal, Bharti would acquire a 49 percent stake in MTN, and MTN and its shareholders would take an approximate 36 percent interest in Bharti. Bharti would also be able to fully consolidate the accounts of MTN under the deal, MTN's statement said. Bharti would serve as the primary vehicle for expansion in Asia and India in particular, while MTN would be the primary vehicle for the conjoined company to expand in Africa and the Middle East, Bharti's statement said. The two sides have agreed to hold exclusive talks until July 31. 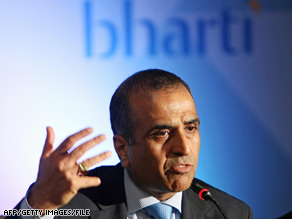 Singapore Telecommunications, a major existing shareholder in Bharti, will remain if the deal is implemented, according to Bharti.